You can also understand how video has become so widespread by looking at the history of business communication technology. Take word processing, for example. When it first hit the market, it seemed that only the most advanced companies would adopt it to replace conventional typewriters. The 1980s changed all that. By the 1990s, desktop publishing similarly displaced word processing as a dominant tool. Later, by the early 2000s, blogs came along. Except, most companies shunned blogging. Until they didn’t. There are countless other communication tools that have emerged over time to transform how we express our ideas. Yet almost all of them have one thing in common: Whereas initially they appeared part of the domain of highly specialized skills, their use eventually became far more democratized. We’re at that inflection point with video. 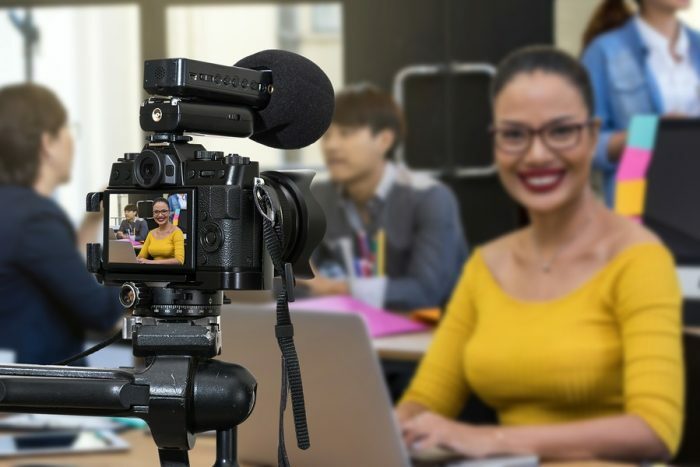 Like communication tools that preceded it, video is now a driving force for companies eager to connect with and influence audiences. Here are some top video trends showing how organizations are — and will be — using video in novel ways. 58% of employees prefer to learn at their own pace. 49% of workers prefer to learn at the point of need. In other words, employees aren’t waiting for their employers to send them to some boring in-person training session. They want to access information anywhere and anytime in ways that allow them to get in, get out, and get back to work. Consequently, workers are turning to explainer videos. As prominent talent management advisor Josh Bersin points out, “In the consumer world, we want people to spend more and more time on our content. In the corporate learning world, we want them to spend less.” So sure enough, it should be no surprise that videos shouldn’t exceed six minutes to maintain people’s ever-shrinking attention spans. And while explainer videos themselves are not entirely new, animating them is a growing trend. That’s because unlike conventional videos that often demand scouting locations, auditioning actors, choosing sets, and major editing, animated videos are simple and affordable to create. More and more organizations are discovering that they can use animation to engage people with content in ways that traditional videos cannot — because with animated videos, the only limit to explaining complex concepts is your own imagination. 19% increase in open rate when an email subject line mentions the word “video”. 80% increase in conversion rate when a video appears on a landing page. 90% of consumers say that video can help them make buying decisions. 4 times more buyers prefer to watch a video about a product than those who prefer to just read about it. As a result, the script has flipped when it comes to how companies use video. They aren’t merely using it to support other marketing materials, like e-books and other written assets. They are taking a video-first strategy by prioritizing video, based on the notion that people are growing accustomed to viewing, rather than reading, content. Recruiting marketers have been using video to show potential candidates what worklife is like and to offer them a “day in the life” glimpse of jobs and the people who work there. Some are beginning to complement text job postings with video. Does this mean that video is killing the traditional print stars of marketing? No, not yet. Probably not ever. But it is unseating them as a primary asset. There was once a time when terms like “employee experience,” “candidate experience,” “employee engagement,” and “employer branding” didn’t exist. Today, they are central to a company’s internal and external communications strategies. Organizations now recognize that the strength of their brand — as well as productivity, satisfaction, and other key performance indicators — depends on cultivating strong connections with candidates and employees. Mark Deaton is COO at Vyond, a SaaS video creation company whose mission is to put the power of video in the hands of everyone. He leads several groups of dedicated, passionate support professionals, including the company's customer support, relationship management, and project management teams. With more than 20 years of experience developing and leading support organizations, he has worked with ADP, OpenTable, the federal judiciary, and several start-up companies. Mark holds a B.S. in Music Industry from the University of Southern Mississippi and an MBA from Auburn University at Montgomery. When the weekend comes, you’ll usually find Mark and his family hiking the redwoods of Northern California or pursuing his hobby as an audiophile.